Floor plumbing pipe too far away from the wall for vanity. I do not want to cut a hole into the vanity shelves to accommodate this discrepancy because the shelves are already shallow with limited storage. Is it possible to cut the floor plumbing pipe short and reroute it so that it is closer to the wall using flexible connectors? Will this impede the flow of water? I cannot change the original position of the hole. Yes, you can reroute the pipe. 1) Draw a diagram mapping out how you want the pipe rerouted. Use 90 degree angles and remember you need to leave room for the trap which in your case will be an "S" trap (so named because it looks like an S that's been rotated 90 degrees. This looks like inch and a half pipe but you can cut a piece off the top and take it with you to ensure you get the right size. Before you cut the pipe from the floor, make sure that you do not cut it so low that you won't have room to work. You'll need a couple inches of exposed pipe to be able to glue the pipe properly and have room to hold it steady while you attach the pieces being glued. Build your new plumbing pipe construction WITHOUT glue, cutting pipe to fit and putting it in place, making sure your pipes will be the right length and angles to get around the vanity and into position to fit the S trap. There's really only one rule here - don't run any pipe uphill against the water-flow. Other than that your pipe can go wherever you need it to. After you've tested the fit and ensured you can get from floor to trap and trap to sink ok, number the pieces in order to be placed and then set aside. Apply a very light coat of purple primer to the outside end of the pipe and the inside of the connector. The coat should cover the entire pipe in a band about 1/2" wide. Apply a light coat of glue in the same places - again make sure the coat is complete - don't go too light - excess can be wiped up but shortage can't be fixed. Test your new fitting by filling with water and ensuring it doesn't leak. Do that 2-3 more times and then start gluing the real thing together. The primer does two things - it cleans the fittings and it also softens the PVC temporarily. Being softened it allows the PVC to bond very well with the glue. Once the glue cures, the glued joint will be stronger than the PVC, if bonded properly. Proper curing takes about 24 hours though you can usually use a drain like yours in about an hour, since there won't be any pressure. Not the answer you're looking for? Browse other questions tagged plumbing floor vanity or ask your own question. 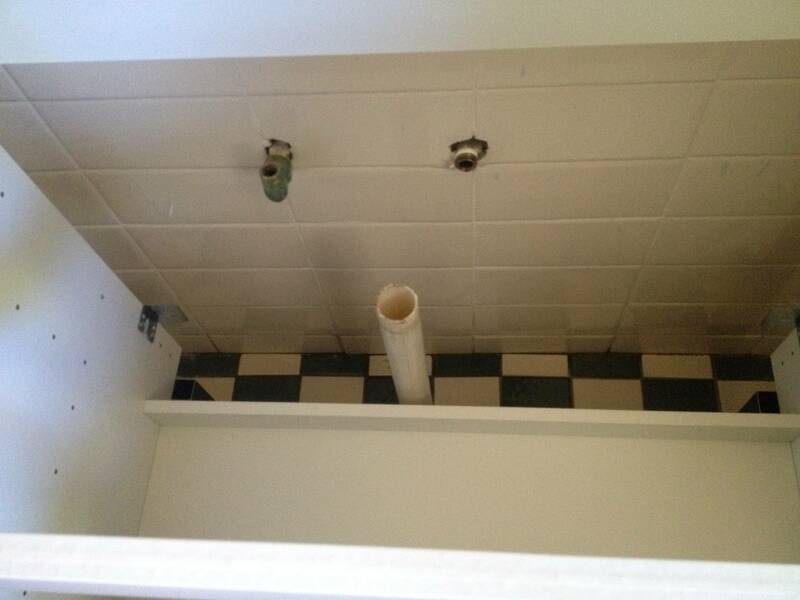 How can I install a vanity over this unfortunate plumbing?